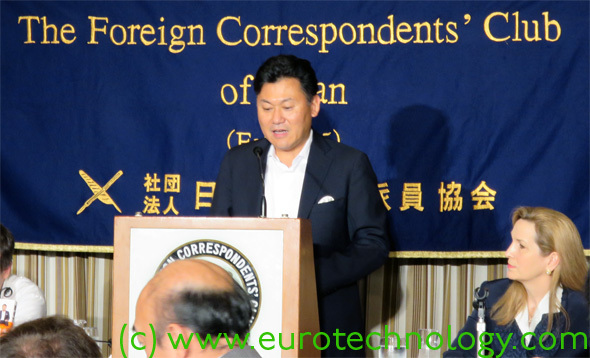 Today Hiroshi Mikitani, Founder and Chairman of Rakuten, gave a talk at the Foreign Correspondents Club about his Japan Association of New Economy (JANE) and about his new book authored with his father entitled Competitiveness. Mikitani is also member of Prime Minister Abe’s Competitiveness Council. Overall Mikitani explained some very reasonable sounding suggestions for changes towards overcoming Japan’s current 15 year stagnation. He made clear, that the No. 1 reason for Japan’s stagnation is not lack of technology or lack of innovation, but is due to insufficient quality of top managers/executives of Japanese companies. Therefore most of Mikitani’s suggestions for improvements focus on increasing the quality of top executives at Japanese companies both via education and also via bringing in more non-Japanese competition. Mikitani also emphasized his close relationship with Prime-Minister Abe, he mentioned having had dinner yesterday with Prime-Minister Abe, and expressed is confidence in Prime-Minister Abe’s abilities and his power to execute. One of the questions the audience asked during Q&A was that similar suggestions for improvements have been heard over many years, and asked whether this time these suggestions will be implemented. Mikitani is Representative Director of the Japan Association of New Economy (JANE). Mikitani emphasizes that the major reason for Japan’s stagnation is not lack of innovation, but top management with low capability and no vision. – Japan’s No. 1 problem are Japan’s executives. Current system protects top management with low capability and no vision. Top management needs to be renewed. Japan must select Key Performance Indicators (KPI) and measure improvements in competitiveness against these KPIs. Must set targets, and measure progress. Japan’s education system is ranked on 43rd position (out of 144) by the World Economic Forum (2012). Quality of management schools is ranked on 80th position (out of 144) by the World Economic Forum (2012).